When buying a new monitor, many users consider which size to choose. With coming Windows 2000 and special graphic cards with two outputs, enabling to extend the desktop onto several monitors, some users think rather about buying two or more monitors (Windows XP supports up to 10 monitors). So you will gain a larger display area for a lower price. After extending the display area you can drag and drop icons and programs from one to another monitor (maximized programs cannot be moved to the other monitor). AGP, PCI graphic cards and particular drivers supporting displaying on several monitors. ISA, EISA, VLB and MCA cards are not supported. Sometimes it is possible to use a graphic card that is not supported, but only for the primary monitor, for other monitors the card must meet the requirements for 100%. Settings for graphic cards you will find in Control Panels - Display, or you can click the right mouse button on the desktop and choose Properties. For each monitor/TV you can set up individual features (number of colors, frequency, resolution). Arrange the monitor icons by dragging: If you are using just one monitor, you will get settings just for this one monitor. If you are using several monitors, there appear several square icons (monitor icons). In this case there are 3. You can click on each monitor image and then configure the particular display device. Clicking the right mouse button you will get the local menu for fast setup. Clicking the left mouse button you can switch between the monitor images. Clicking and holding the left mouse button you can change the position of the squares. Placing them correctly you define the crossing areas. Most often mistakes: 1. When dragging to the left, everything appears on the right monitor (instead of physical moving of the monitor just move the square). 2. It sometimes happens that you move the cursor onto another monitor by mistake - it is advisable to move the square up or down and so reduce the cursor area. 3. Moving the cursor from one monitor to the other is too long - I recommend that you find better combination of settings. 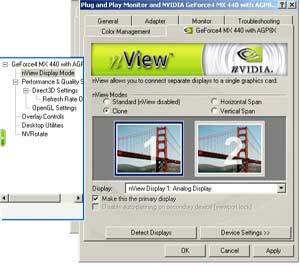 Monitor - here you can choose the graphics card and the monitor which you want to set up. Colors - here you can configure the color depth. The more colors, the better. Screen area - here you can change the resolution. The higher, the better (more information will be displayed). On smaller monitor with high resolution, the data can be unreadable. Use this device as the primary monitor - the monitor you choose becomes the primary monitor on which the main menus and information are displayed. The biggest monitor is usually designated as the primary monitor. To see the changes as dragged taskbar or icons you have to restart the computer. Extend my Windows desktop onto this monitor - activates or deactivates the monitor used for extending the desktop. Identify - displays a number on each monitor image. 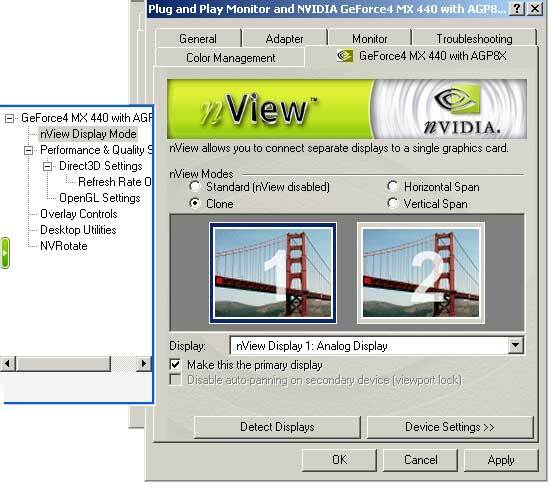 Advanced - this option specifies the monitor´s and the graphics card´s properties. You can change font size, refresh frequency, drivers, hardware acceleration and other. The optimal setup of the refresh frquency and the resolution will make your work on the computer more pleasant and you will save your eyes from harm! Check if the graphics card is functioning and check its driver in the Device Manager. Try to change the order of the adapters (primary for secondary) - Init Display First in BIOS (AGP or PCI). Use another type of graphics card - some types cannot be used. It is recommended that you only use cards listed in HCL on the Microsoft Internet sites (I have a good experience with ATI Rage Pro, ATI Rage IIC and Matrox Mystique, many problems I had to face with VGA, and S3 Virge and S3 Trio chips). Change the configuration. E. g..: 1. change the PCI slot, 2. use another motherboard (another type or made by another manufacturer). 3. Change the driver. 4. Change the configuration order (it is advisable to add the graphics adapters after the system installation, sometimes it is necessary to change the order). To find the right graphics card and to run multiple monitors need not always be successful at the first time, sometimes it takes longer, or you can also completely fail. If you want to make a screen copy using the Print Screen button, you will not get a single image of one single screen, but a combined image of all being used screens. In this case 3 screens. After extending the desktop, you can drag and drop icons, taskbar and programs to another monitor (programs only if opened in a window, maximized windows cannot be moved to another monitor). To maximaze a window on other than the primary monitor, you have to move the window to the other monitor and here to choose the maximize button. Playing movies, playing games and running the DirectX application is usually not possible on other than the primary monitor. If you want to use the command prompt in full-screen mode, you have to use the monitor of the first initialized graphics card, it is: the primary monitor of the computer - it can but need not be the same monitor as the primary monitor of Windows! Dualview - Microsoft describes the Dualview feature as multiple monitors support of Windows XP Professional for portable computers or VGA cards with two monitor outputs. This feature is similar to multiple monitors, but does not require to have several graphics cards. You usually cannot choose an adapter to be the primary one - it is always the primary port or the NTB´s LCD screen. According to the manufacturer and the drivers, you can do much more - e. g. cloning. In the documentation by nVidia there is the Dualview feature described as a feature for making the particular outputs independent - one card pretends to be two and so allows to set different parameters for each monitor. nView (TwinView) - Technology developed by nVidia. It allows the graphics card to display the image on several display devices (CRT, LCD or TV). Clone - there is the same image on both outputs. Its disadvantage is that you usually have to use the same parameters for both devices (resolution, frequency, number of colors). Very useful for NTBs with connected second monitor or dataprojector. DualHead, TripleHead - this is name of cards made by Matrox that enable you to connect two or three display devices. According to drivers, you can use the clone feature or you can extend the desktop. You can also play a DVD on the secondary monitor, and, at the same time, you can work on the primary one. Multiple monitor support is not only the priviledge of Windows 2000/XP; it also works in Windows 98, but it is a bit limited.